Fr. 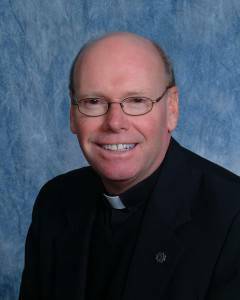 Leon Hutton is an alumnus of St. John’s Seminary, Camarillo and was ordained in 1980. Raised in Camarillo since the age of 10, Fr. Leon Hutton attended St. Mary Magdalen School and then Santa Clara High School in Oxnard. After ordination, he served in two parochial assignments at St. Robert Bellarmine Church in Burbank and Holy Family Church in South Pasadena. In 1989, he was sent for further studies to The Catholic University of American in Washington, DC in preparation for seminary formation at St. John’s. While at Catholic University, Fr. Leon studied Church History with a concentration in the area of American Catholicism. For the past 20 years, Fr. Leon has been an assistant professor of Church History. His interest in the history of American Catholicism has fostered his participation in national organizations and has been a regular presenter in the local University Series. As a seminary administrator, he served for 10 years as the Director of Students and then as the Director of Human Formation and Evaluations. In his capacity as a seminary administrator, Fr. Leon has served on a variety of Archdiocesan and National organizations concerned with priestly ministry and seminary formation. Fr. Leon presently serves on the Board of Directors of the National Catholic Educational Association. While serving at the seminary, Fr. Leon has remained close to parish life by teaching adult education classes, participating in parish penance and other religious services, and assisting as the weekend priest at St. Julie Billiart Church in Newbury Park. Fr. Leon is excited about returning to full-time parish ministry at Our Lady of the Assumption.